Cutthroat Drift is a green track: just passable for a car, which turns off the Dereham Road shortly before the sharp corner into Yaxham village. It winds around a little at first, then straightens, and is straight for a long way, rising and falling over small undulations as far as your eye can see. Why it is to straight, without any aim in its straightness, seems rather mysterious. The men that made the rolling English road walked steady when them came to this lane. 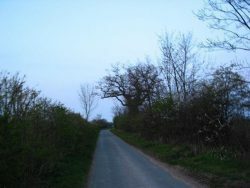 At any rate, it goes on and on until, with the freakishness for which Norfolk roads are notorious, it bends a complete right angle and joins Mattishall road. Now read: Cutthroat Drift is so named because a young woman’s throat was cut long years ago. Then listen to this: just beyond the right angle bend, in a small plantation, years and years ago, the body of a man was hung in chains. This how the chains, as they swung gently to and fro in the wind must have clanked. This man, as far as one can piece out from history and legend, was not responsible for the murder of the unforunate young woman. He hung for another grisly tale. His name is popularly supposed to have been Clifton, although little is known about him except his name. One evening, so they say, he called in the bar-parlour of the inn which stood in Church Lane. They called that inn the “Great A”. Old people of the parish can remember the days when the inn was open. Clifton was there, sipping his beer when a farmer came in – a hearty, loud voiced man who had been doing some good business and felt pleased with himself. A few drinks made hims still more pleased. He seemed very generous with hims money and soon revealed that he had a large amount of cash in his pockets. Clifton did his very best to draw him out and listened to every word he said. The farmer was pleased to have a good listener and it was not long before he was assuring Clifton that he was his lifelong friend. What was more natural than that the two should leave the inn together. Clifton took him a quiet way, and along a path which used to lead from the Church towards the mill on Mattishall road. Half-way there, in a field that to this day is called “Clifton’s” field, he murdered the man and stole his money. For that he was hanged – outside the County gaol at Norwich, I believe, and his body was afterwards taken to Yaxham and hung on a gibbet in chains for the edification of the inhabitants. The site chosen was not actually the place of the murder, but not far from it. When our ancestors did this sort of thing, trussing up dead bodies of murderers at or near the scene of their crime they thought they were doing it as a dreadful warning to others. Years afterwards the field in which he was hung was being ploughed and his skull came to light again. The skull is now in Norwich Castle Museum, but it went through many vicissitudes before it arrived there. Many of the older generation in Yaxham can remember passing the skull from hand to hand, while Mrs Eke, senior, one of the oldest people in Yaxham will tell you that it was her grandfather, Aaron Lane, who took the “swivels” down off the gibbet after the last grisly remains had fallen or been buried.